Less than four hours after arriving in Florence, I was lying painfully on my side, with my ankle sickly twisted underneath me. Not entirely sure of what had happened, I was highly aware of tremendous pain and the nearly overwhelming urge to be sick. After several minutes of attention from my fellow tour-mates, one of whom is a medical doctor, I was able to sit up and confirm to all of them that I really, honestly, truly did not crack my head, but that my ankle was probably broken. I call this event my “graceful, quiet move” because it was neither. I’d been exiting a church, and was looking at the viewing screen on the back of my camera instead of where I was stepping. I’d tripped and missed a step – and had fallen down a few more until I landed at the bottom with a huge clatter, a destroyed camera, and a foot that wasn’t pointing in the same direction as it was when I’d started. Wow. Welcome to Florence. After a short wait, my tour guide arrived – Stuart is a chipper British man with a loving and often hilarious perspective of Italian life. He let me know that the official people must send me to the hospital in an ambulance to protect their own ability to get insurance coverage. I concede, and the paramedics are called. Immediately, the women of the tour group got sudden bursts of energy. Like a swarm of worried butterflies, they picked the sticks out of my hair that I’d snagged while laying on the ground, they produced lovely little tissues to wipe my mascara from where it smeared on teary eyes, and they let me know that my makeup and toenail polish were “just lovely.” All this, because Italian paramedics were on the way! It was only a few minutes until we could hear the sirens. The embarrassment from all of the attention was probably a good distraction – on the verge of a hard cry and still fighting the urge to throw up, I knew if I weakened my resolve with my tears or my stomach, I’d have been out of control with both of them. So surrounded by sympathetic and worried glances, with my teeth chattering and my foot sticking up in the air, we waited. The younger women of the group got more excited about the prospect of Italian paramedics as the sirens grew louder. I just wanted it over with, and it was hard to be in the wheelchair, in that much pain, without contemplating the effect this accident was going to have on my vacation. 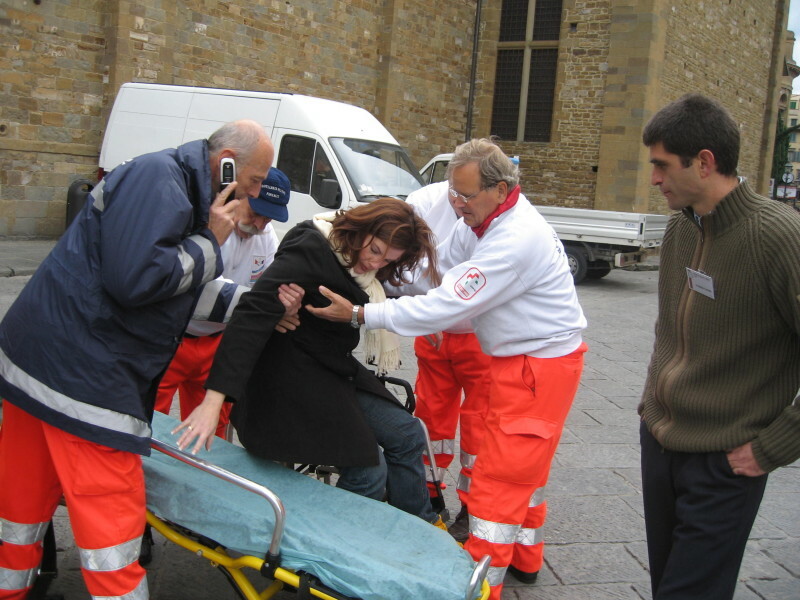 Without much delay, the ambulance pulled very near the church plaza in which I was waiting, and the sirens were silenced. People on the tour got very quiet as the clatter of the ambulance doors, hurried conversations, and heavy footfalls got louder. Then with a flurry of commotion and day-glo orange uniforms, the Italian paramedics burst through the doors into the church plaza. No small production, this was. Nor was it “Baywatch, Italian Style.” While the women of the tour touched up their lips, Italy had lovingly sent me her version of the Keystone Cops. It didn’t take long to realize the sirens were not for me. The sirens were to announce paramedics and introduce them to the world: they are important! They are in a hurry! And holy cow they are orange! Four men in their fifties and sixties and one young woman take over my care. She is a little timid and smiles at me reassuringly. One man is very tall and stoic, and never takes his cell phone from his ear. One man is very short, with a large handlebar moustache. Another ties his neck scarf very neatly and gestures with his glasses to punctuate his speaking. The last is a round, happy man with sympathetic attitude and a little bit of English in his repertoire. The paramedics’ presence in the small, cold plaza is a spectacle of commotion, rapid hand movements, and argument. Though there was no evidence of anger, they all talked at once, upping the volume to be heard over the rest. Interestingly, all of them went silent as “Handlebars” unwrapped my foot. With a gentle touch, he poked this, prodded that, and slowly moved my foot this way and that. Having all of them around me was freakishly like being in a well – the huddle was so tight, light could barely infiltrate. Satisfied with his exam, “Handlebars” spoke two or three words which I did not understand, and then the commotion re-erupted. How could they not injure each other with all those arms waiving around? How did “Glasses” hold onto his glasses in that mess of flying hands? The volume got louder, though still not angry, until it ended as suddenly as it began. Apparently, they had reached an agreement. Who prevailed, I have no idea. But we were on our way. “Stoic” was still on the phone. Handlebars pushed my wheelchair while the rest walked along side or trailed. Happy looked at me and said, “Americana, bad day.” We laughed at that as we exited to the parking area where the ambulance was ready. The young woman had a gurney waiting, and the five of them helped me move from the chair onto it. My feet stuck over the end by about twelve inches. Happy said, “Americana, too tall,” and made a comical gesture to help me figure out that I needed to scoot up. They wrapped me with blankets, elevated my feet, and strap me in. As they talked with my best friend and my tour guide, explaining the details of where we’d be going, I turn my head and take a look at the ambulance for the first time. I’m not positive, but I think the manufacturer must be Fisher-Price, because I’ve never seen a multi-passenger vehicle this small. Seven of us were going to fit in that? Someone’s kidding, right? Nope. With a forceful push, my gurney is loaded into the back of the van. I’m still too tall, and while the rest of them are trying to figure out how to fit us all inside, I’m negotiating with Happy to drop my feet so that I can sit up. He doesn’t want me to sit up, he wants my injury elevated. “But we can’t close the doors,” I explain. “Oh, yes. That is problem” he laughs. Yes. It is. Sigh. Finally, with all of us loaded into the ambulance (and the doors mercifully closed and latched), we’re off. My friend is sitting next to me with the address of our hotel, our guide’s telephone number, and my insurance card. The young woman was sitting on a fold-out seat near my head. Handlebars and Stoic were in the front, and Happy and Glasses were at the rear, crammed onto a tiny bench seat. My friend was worried, but everyone else was jovial. The young woman struggled with translation and wrote up my forms listing me as Russian. Happy and Glasses hooted with laughter. After a few minutes, Happy looked at me and says, “Codico Verde. Code Green – that’s you.” “That’s good, right?” I asked. “Well, it’s critical. But not so much,” he said, as if that explained everything. Critical. But not so much. At this point, I knew I’d be OK. Happy unloaded me and the gurney once we arrived, and pushed me into the hospital while the rest of the entourage was close behind. Still too tall for the gurney, my injured foot was in the way and regularly jarred by his round belly. He joked with me all through the halls, until we arrived at the emergency room intake counter. They dropped the gurney down low so that I could get off of it and into a wheelchair, and I was able to do so without much assistance this time. Handlebars decided that the leg of the wheelchair should be raised to keep my ankle elevated. He held my leg up in the air as he squatted and worked on the wheelchair with one hand. Unsuccessful, he handed my leg off to Happy so the he could get both hands on his task. Frustrated with Handlebars’ failure to raise the leg of the wheelchair, Happy handed my leg off to Glasses while he got involved with the chair. Annoyed that neither of these two could fix the chair, Glasses called over a hospital attendant to help and dove in himself. Meanwhile, my leg is being passed from paramedic to attendant as their arms got tired of holding it up in the air. Finally, I lifted it by my pant-leg out of the way and take control of it myself while four of these crazies fought with the chair I was sitting in. Twice, I offered to get out of the chair in hopes it would be easier to fix, but they had none of it. That would have indicated failure. After an hour of exams and X-rays, I was assured that I didn’t have a fracture, but a substantial sprain that would require medical care. The attending doctor had spent some time working in here in the Seattle area, and proclaimed in clear English that “People from Seattle are strange,” I asked why he thought people from Seattle were strange, and he replied very matter-of-factly, “Too close to Canada.” Ah, well that must explain it, I supposed. This place is crazy. Fun, but crazy.